Phew. That was a game and a half. Time for us to say say goodnight. Don't forget: Match of the Day, 22:20 GMT on BBC One. West Brom boss Tony Pulis also added: "From the last nine games we’re sixth in the Premier League on form. We’re on a good run. “We played really well so they (the fans) had something to cheer and at the end when they needed them they got behind us." West Brom boss Tony Pulis told the BBC: “We played really well first half, as good as we’ve played. People can see when Saido and Solomon play together what a handful they are. “We haven’t had that for half a season. If you take Kane out of Tottenham or Vardy out of Leicester, that’s how big a gap it is to take Saido out of this team. Those two were a real handful. “He (Berahino) was very good today and the rest of the team were, he was unlucky not to get a few other goals as well. "I’d have been devastated if we'd not won that game. We played some good stuff. I thought they went back to front and caused us lots of problems but we dealt with it and when we got time we played good football." Crystal Palace boss Alan Pardew on Scott Dann's penalty appeal: “It was blatant penalty, I could see it from where I was, the referee said he couldn’t see it but the linesman should have seen it. Scott was barged in the back, but we never seem to get those calls as we are a big side. Yannick Bolasie was good when he came on and he let it run across him [for his penalty appeal] but the guy took his legs." Crystal Palace boss Alan Pardew: “For the first 30 minutes they swamped us with aggression and power. Their front two caused us problems but our front two didn’t and our distribution wasn’t good. “The first half was a shock to me, the goals went in quickly, and it knocked our confidence. In the second half we were a completely different side. Our two strikers were ineffective but looking at Emmanuel Adebayor, I have to manage him properly as we have a game on Tuesday. “The structure of the team worked a lot better for us in the second half, that’s how we’ve had our success with Yannick Bolasie and Wilfried Zaha on the wings and that gives us more balance. 3-0 down at West Brom is a tough agenda, so credit to them for coming back." West Brom midfielder Chris Brunt was taken off on a stretcher in the first half with a knee injury. Manager Tony Pulis has said: "We won't know the extent until tomorrow. It's a blow for us." Oooh, this game's crept up to second in tonight's Match of the Day running order. Don't forget: BBC One from 22:20 GMT. In case you were distracted by all the goals in this game, we've had some news coming out of Everton tonight. Iranian businessman Farhad Moshiri has bought a 49.9% stake in the Toffees. Moshiri, 60, sold his stake in Arsenal to business partner Alisher Usmanov on Friday so he could buy into the Goodison Park outfit. "After an exhaustive search, I believe we have found the perfect partner to take the club forward," Everton chairman Bill Kenwright said. BBC Sport's Alistair Magowan has written all about it here. Have a read, why don't you. 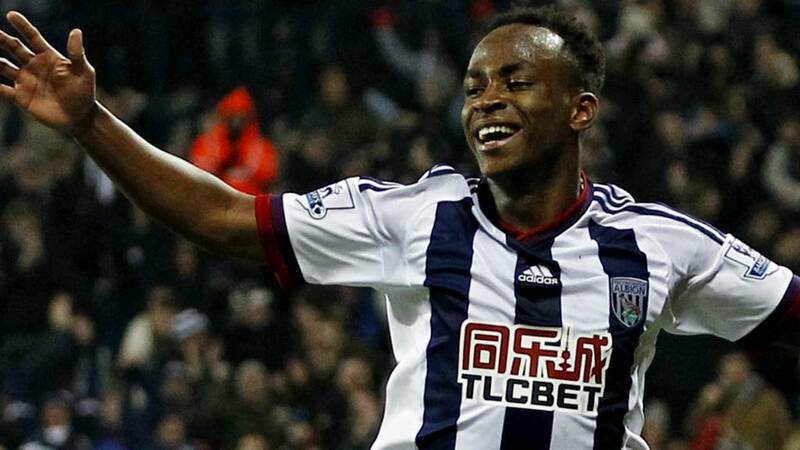 West Brom goalscorer Saido Berahino told the BBC: “I can only thank God. I’ve been through a lot this season but I’ve put the past behind me. I was just out there enjoying myself. “As a footballer you just want to go out and show what you’re about, that’s what I’ve done today. I tried to contribute as much as I can. It was a really important win for us. “We worked really hard after defeat to Reading and came out in the first half, got the three goals, but we were disappointed to concede two in the second. That's two Premier League wins in a row for West Brom now and it moves them up to 13th in the table. For Crystal Palace, they remain without a league win in 2016 - a dismal run of 10 games. They replace the Baggies in 14th. That was an absolute cracker of a game, that. A must-see on Match of the Day later - BBC One at 22:20 GMT. Tony Pulis...you may breath a sigh of relief. There's fans leaving early?! HOW? The supporters who have stayed are in fine voice, though. West Brom earn a free-kick out on the left-hand side, but Saido Berahino simply plays about with it in the corner to waste some time. Tony Pulis looks like he's foaming at the mouth. The West Brom manager must be a bag of nerves with minutes left to play. Palace are still coming forward. Mile Jedinak, a second-half sub for the visitors, swings the ball in and it's cleared by Craig Gardner, who's been immense. Five minutes of stoppage time, just like in the first-half. Anything could happen in that time! Well, not anything. But you know what I mean. The Baggies have brought on Sandro for Salomon Rondon. Will the fresh legs help West Brom hold on? Palace earn a free-kick dead centre, about 30-yards from goal. Dwight Gayle to take it...but...it's not very good. He chips it wide. Wilfried Zaha goes on a lovely run. Not one West Brom player attempts to stop him. Joel Ward then earns a free-kick for Palace on the edge of the area after he's clattered by James McClean. The set-piece is taken and it eventually comes out to Ward, who has a go from distance but it goes wide. Ollie, Bristol: Sessengnon, Rondon, Berra, Gardner, Yacob and Dawson all been immense for us tonight. Do we dare believe that Pulis will have listened to the fans and turned a corner? Get involved by tweeting #bbcfootball, text 81111 or use the BBC MOTD Facebook page. Jordon Mutch swings it in and Scott Dann's header is cleared off the line by Craig Gardner! That was nearly 3-3. Madness.